We can help you with all manner of paint and body issues from minor fender benders to significant frame repair, minor paint imperfections to complete refinish of your vehicles exterior. We can add 3M stone guard to protect your hood from rock chips. If you have been in a collision, we can take your car, repair it and hand it back as good as new. 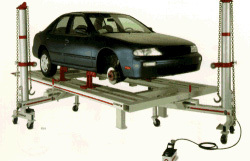 Our E Z Liner frame machine can make sure your car drives down the road as straight as an arrow.